Home > Government & Politics	> Can Congress Cut Spending? As part of their Pledge to America, Republicans promised to cut $100 billion of federal spending in the first year they were in office. With the Republicans regaining majority control in the House of Representatives, the pressure is on for them to act. Let’s take a little look beyond the political rhetoric and consider some of the facts. Congress has yet to pass the 2011 budget, so the government continues operating based upon the 2010 budget. Total federal spending for FY 2010 (October 1, 2009 – September 30, 2010) was $3.55 trillion. Mandatory spending (i.e., Social Security, Medicare, debt service) was $2.184 trillion, defense spending was $664 billion and all other discretionary spending was $702 billion. The deficit for fiscal 2010 was $1.42 trillion. When you look at federal spending of $3.55 trillion, $100 billion is approximately 2.8% of the total. It’s hard to argue that a 2.8% reduction in expenditures is a draconian cut. However, opponents of the cuts have a valid reason to be concerned. 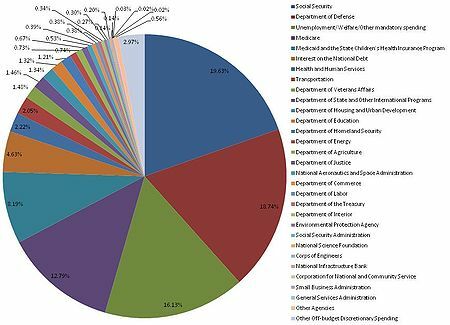 When Congress talks about cutting spending, they usually are referring to non-defense discretionary spending, which is only about 20% of all federal outlays. When you look to trim $100 billion from $702 billion of spending, the cuts are far more dramatic, so it’s understandable why the recipients of these funds are concerned. Furthermore, this is the area of the budget that directly impacts the various constituents of a particular Member of Congress, which is one of the reasons it’s so difficult to enact spending cuts. Everyone is trying to protect their turf. Irrespective of these issues, I believe that Congress has to cut spending. When you look at the numbers, there is simply no way that the government can raise sufficient revenue to balance the budget, nor can it continue to overspend in excess of $1 trillion each year. At the current rate of spending, the total federal debt is projected to be near $20 trillion by the end of 2015, and will continue climbing ad infinitum. It doesn’t take a genius to realize it is unsustainable. I’m also of the opinion that this is a test of Congress’ true mettle and ability to deal with our fiscal crisis (yes… I’ll call it a crisis). On the big picture, if Congress can’t trim $100 billion from nearly $3.6 trillion of spending, something is wrong. That’s less than 3% of the total pie. It’s also less than 10% of what would be needed to balance the budget. Given the political dynamics of Washington, the burden doesn’t rest solely with the Republicans. President Obama and the Democratically controlled Senate also need to be part of the process. Both parties contributed to the debt and excess spending, and both need to be part of the solution. Without doubt, it’s going to be a difficult and painful process. Just like your personal finances, it’s easier to increase spending than reduce it, but if necessary, you do it. For me, a $100 billion spending cut is the beginning and not the end. They will need to reduce spending by much more to solve our fiscal crisis, but you have to start somewhere. Time will tell if Congress really can reduce spending.